IN the sixteenth century, approximately 1567, Spanish adventurers discovered a group of large and beautiful islands in the Western Pacific. Mendana was the leader of the Spanish expedition and his descriptions of the islands were full of "magnificent and beautiful exaggeration". It is said "that the islands were named the Isles of Solomon, to the end that the Spaniards supposing them to be the islands whence Solomon fetched the gold for his temple might be the more desirous to go and inhabit the same". There were six ships in the original expedition, small craft with their full complement of men and carrying many priests. They were eager to claim their discoveries for the Spanish king and Church. They had visions of converting the people. All came to nothing: native and Spaniard found no way of mutual approach. The gigantic "canoes" of the white men, and the dreadful thunder of their guns must have appalled the natives. To the Spaniards the natives, at first attractive, became objects of fear and dislike. They seemed treacherous and were cannibals, ignorant to Spanish eyes of the most rudimentary culture, and so all efforts at settlement failed. An effort was made by force to establish a colony on Santa Cruz, but thee whole story is one of bloodshed and failure. Mendana died here in 1595. The last Spanish ships sailed away, their journals were [1/2] placed in Spanish archives, and the Solomons disappeared from the ken of the white man. Little trace remains of the Spanish visitors. The names of some of the islands, Guadalcanar, Ysabel, Florida, Santa Anna, San Cristoval and Santa Cruz tell of their visits. 1768. Further discoveries and re-discoveries were made by French explorers, such as Bougainville, and then by Captain Cook who was in the Pacific between 1768 and 1780, and the South Sea Islands began to be known and tales therefrom to be the delight of romantic minds. Captain Cook made friends wherever he went. He distributed pigs, the descendants of which are in the islands to-day. 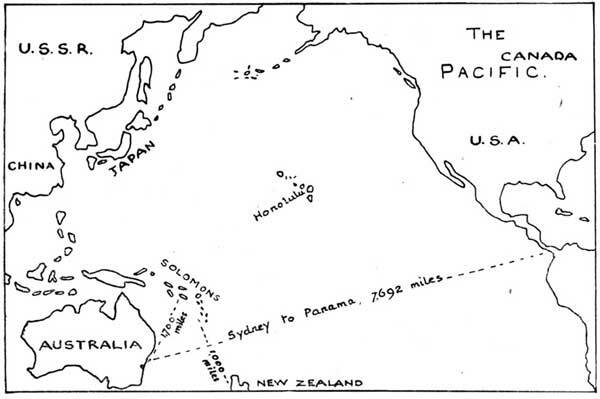 A complete general map of the Pacific will show islands in great numbers and very widely distributed. Our immediate concern is with the islands of the Diocese of Melanesia. Looking at the map No. 1, you will see a chain of island groups following roughly the bend of the north-east coast of Australia. In the south the New Hebrides (map No. 3) the islands of Raga, Aoba and Maewo belonging to the Diocese of Melanesia. The New Hebrides has been under a Condominium Government since 1906. It has a Joint Court composed of British and French judges, and a neutral President and an Executive Government acting for some purposes in concert. For other purposes, British and French nationals remain subject to the control only of their national authorities. Northwards at intervals are small groups, The Banks Islands, Torres, Santa Cruz and Reef Islands, the Duffs and isolated isles like Tikopia and Anudha. Then a longer stretch of ocean and the Solomon Islands appear. 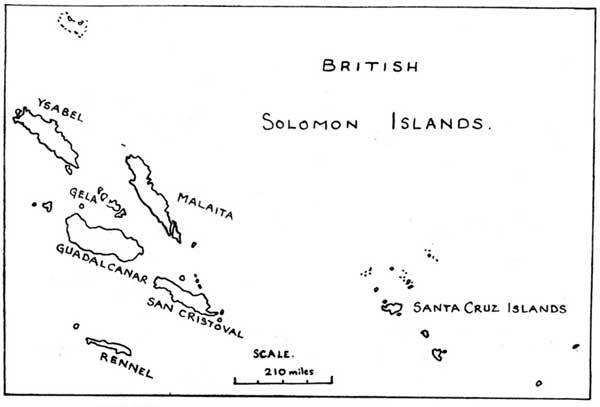 The Solomons (map No. 2) was declared a British Protectorate in 1893. The area is [2/3] administered by the Colonial Office through the Governor of the South-West Pacific who is resident in Fiji. A Resident Commissioner lives at the capital of the Solomons, Honiara on Guadalcanar. Various Government officials have their headquarters here. District Commissioners are stationed at various points on the other islands of the group. This is the Diocese of Melanesia, a chain of islands almost 1,500 miles in length. Its most southerly point is 800 miles from New Zealand. The Diocese is roughly 1,200 miles from the Australian coast. It will be noted that two different Governments have jurisdiction over parts of the Diocese. Each of these has, of course, different laws and regulations. Some of the islands are of volcanic formation with mountains up to 6,000 feet. Others are low lying coral atolls. The larger islands are covered with dense bush right down to the shores: All of them have coconut palms in profusion. It is not possible to describe fully the animals, birds, reptiles and insects here. Let it be said that there are pigs, many of them wild. Dogs who find it impossible to bark!--horrible mangy animals often without hair. Rats--there is a pouched variety reported--cuscus and numbers of fruit-eating bats, known generally as flying foxes. Cockatoos, parrots, lories and pigmy parrots. Kingfishers, duck, pigeons, hawks, eagles and frigate birds. There are hornbill and crows on the islands of Guadalcanar and Ysabel. Crocodiles, snakes, lizards, geckoes, toads and enormous frogs. Butterflies of great size and beauty and numbers of camouflaged insects. White ants are busy at their work of destruction everywhere. The mosquito is present in myriads. The People . . . are of mixed origin and the mixture is uneven. There are probably descendants of the first [3/4] inhabitants. Two other streams of migratory folk came to the islands, the Melanesian and the Polynesian. Since then, particularly in certain areas, they have become more or less mingled. 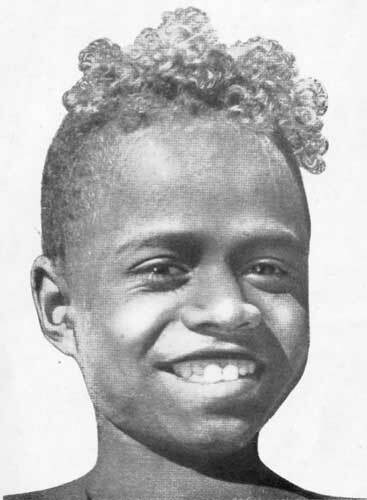 The Melanesian has a dark skin, with black, crinkly, upgrowing hair. He usually carries a stiff bush on his head combed upwards. He is short and strongly built with a dull and somewhat heavy carriage and slow-moving wits. He is of a somewhat sulky temperament--some perhaps would prefer to say reserved--and amongst strangers, an unsocial being. The Polynesian, who came later, is a big fairer man, of huge limbs and silky down falling hair of a light colour. His features are finer than the Melanesian's, his temperament lighter and more fiery. These races are now mingled in unequal proportions and the average Melanesian is the product. 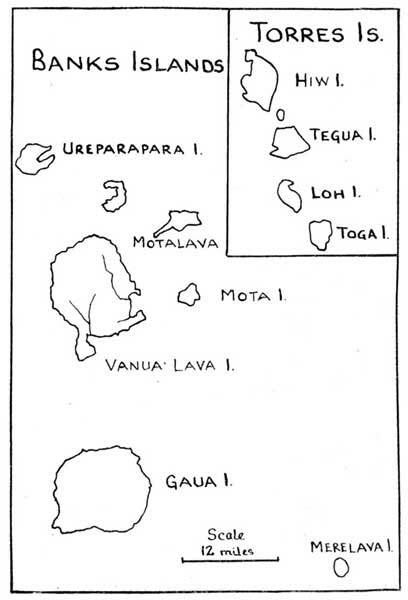 In some islands there is little or no mixture, as in Tikopia Anudha, and Sikaiana which are entirely Polynesian. 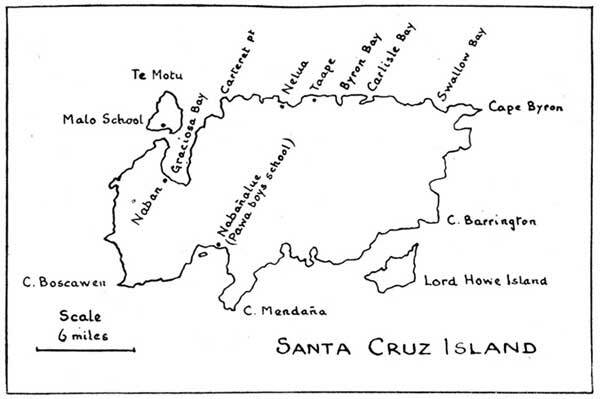 Santa Cruz is mainly Polynesian, Ysabel and farther north is mainly Melanesian. The islands offered these folk an easy life, a hot sun and warm sea, thick tropical bush for shade, lagoons swarming with fish and turtle . . . also sharks. The coconut is everywhere available for food and drink as desired. The paper mulberry gave bark for clothing for those who wanted it. A very light easily built hut sufficed for shelter, and the sago palm provided timber and thatch. Leaves of various kinds were woven into mats for bedding and furniture. Pointed sticks were the spades with which they planted yam and taro, stone adzes and axes were the tools for shaping bowls and canoes. Ashore there were no wild beasts to fear. A very moderate amount of labour could give them all they wanted, time was of no account, the future was left [4/5] largely to itself. What was the result of these conditions? Stagnation, suspicion, superstition, division, strife, murder, fear and again fear, and yet again fear. The people were afraid of each other, afraid of every new happening, of every stranger, afraid from the cradle to the grave of evil spirits. By nature they seemed to be kindly, great lovers of children, averse from seeing pain inflicted, timid and irresolute. Yet, fear-driven, they became a collection of warring individuals and tribes, bloodthirsty, treacherous, liable to "see red" at short notice, cannibals, and ready to do anything however mean and nasty to propitiate angry spirits or exultant conquerors. Today, one group of visitors will speak of the Melanesian as some vile creature, hardly human and, at best, moderately useful for labour. Another group will speak of him as a happy laughing child, innocent of evil, a simple follower of nature. The experience of the missionary teaches him how far from reality both sets of observers have strayed. "Little better than animals", says one party. But these "animals" make beautiful things for the satisfaction they find in the making. Inlaid work of pearl shell set in canoes, clubs and sticks: their woven work of coloured grasses, their shell ornaments . . . all these show a sense of proportion, colour and beauty. They indicate the use of brains and the ability to take pains in producing beautiful things. "Simple children of nature" . . . "their life is all joy ". Perhaps they found excitement in lives filled with fear, but there cannot be much joy in living in constant fear of disaster or death, from spirit or man, on any day at any moment. For the future there was no hope. The obvious thing was to enjoy such [5/6] passing moments as were free from actual alarm, to make feasts and dances and songs, to chatter by the light of great fires flaming in the dark nights, to dance and to sing. Ships. Some hundred years ago the white man began to visit these people more regularly. Five kinds of ships came. First came the sandal wood ship. Traders, daring, greedy, unscrupulous for the most part, sought the coveted wood by persuasion, and when this failed, by fraud or force. Then came the "thief ship". This was the recruiter. It came to collect natives for labour in the sugar plantations of Queensland and Fiji. Many adventurous natives dared the risk, for the love of a new experience. Many were enticed by the prospect of getting some of the white man's goods. Others were trapped by trickery and taken away under hatches. When this happened, or when news came that one or other of the recruited men was dead, the next vessel would be met by opposition, and in revenge, efforts . . . too often successful . . . were made to kill one of the white men and to take his head. Any white man would do. 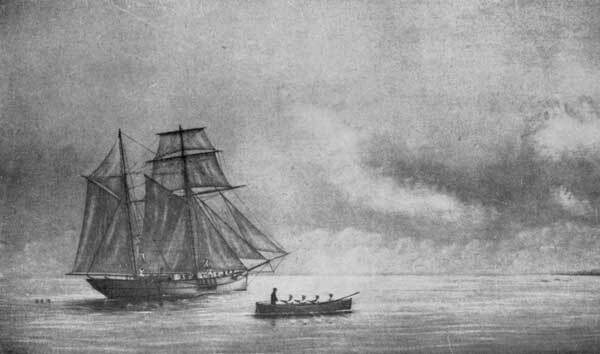 There came another ship--the "man-o'-war". It was difficult for the native to understand her errand. Often she came to do justice and to teach respect for human life. Enquiries had to be made in order justly to redress wrong, and that was very hard to grasp. For whatever reason she came she was for the native a dreadful thing. The fourth ship, in kind but not in sequence of arrival, was the Mission ship. The first came in 1849. Presbyterianism began in the New Hebrides, and Bishop Selwyn of New Zealand, whose diocese included these islands, took a ship and visited the [6/7] New Hebrides and the Solomons. The first ship was the Undine, precursor of a line of vessels all named Southern Cross, the present ship is the seventh of her name. The natives soon named the Mission ship "akanina", i.e. "our ship". For a hundred years these ships have been at work, at first, travelling from. Auckland, New Zealand, through the Diocese and back again. Later on the ship remained within the Diocese, going out only for periodical surveys. Regular steamers were then running between the islands and the mainland, and cargo and passengers could travel in them. Thus the Southern Cross was available for more direct Mission work. Since the war the Mission has been obliged to revert to the original method again as regular ships have not been put on the island runs. The Mission ships have always been a means of collecting boys for schools. Selwyn got five on his voyage. These were taken to Kohimarama by the beach near Auckland, for training. They were clothed, taught, trained physically, morally and spiritually and then taken home to be the first of a successive band of evangelists and teachers to their own people. This, of course, was our Lord's own method. He called, He chose, He taught and He sent. John Coleridge Patteson joined the Mission and became the first Bishop of the new Diocese in 1861. In 1867 it was decided that Norfolk Island should become the headquarters of the Mission. Norfolk. Island lies on the sea route between Auckland and the islands. It is sub-tropical and was a more suitable place for the natives than New Zealand. It remained as headquarters until 1920 when the whole of the Mission's establishments were moved to the islands. 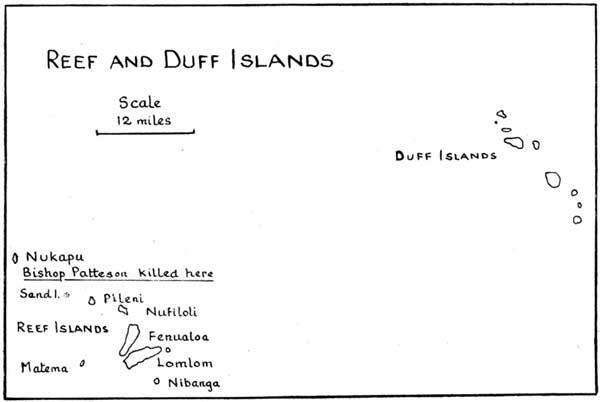 In 1871 Bishop Patteson was killed on the island of Nukapu (see map No. 10). That martyrdom, it was no less, brought to an end the infamous traffic of the "thief ships". Many years later there came another kind of ship: The Sydney steamer and cargo vessel. These ships carried away the produce of the islands, chiefly copra, and returned with stores of all kinds. The traders' schooners and launches within the islands were visiting the villages buying the native copra and selling trade goods, calicoes, tinned meats, tobacco and tools. The Melanesians liked to work on these vessels. They were well paid, the work was of short duration and the constant movement from place to place was attractive. Stages in the work of the Mission. The Southern Cross had its part to play in all of these and continues its important role to-day. Latterly a number of schooners and launches have taken their places in the work, to-day there are nine of them. At first the voyages were of discovery and exploration. Men were landed on unknown islands, often at great risk. Once contact was made, friendliness was assured. Then the stage of occupation. The white missionary being landed for a stay of several months during which he cared for the Melanesian teachers already at work, returning again for a turn at Norfolk island. 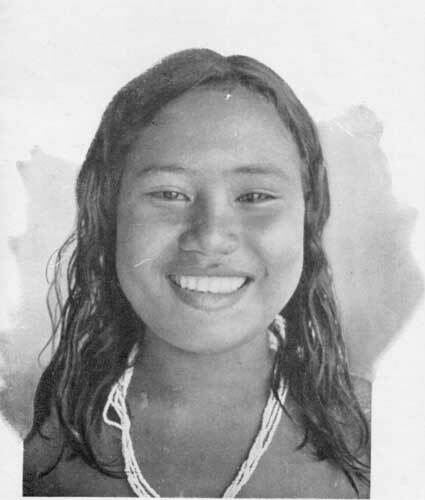 The missionaries made longer and longer stays, women missionaries were placed in the islands and more or less permanent stations established. Normally the Bishop is travelling in the Southern Cross, and is engaged in the episcopal work of the Diocese. The Archdeacons and other priests use the small vessels as a rule. 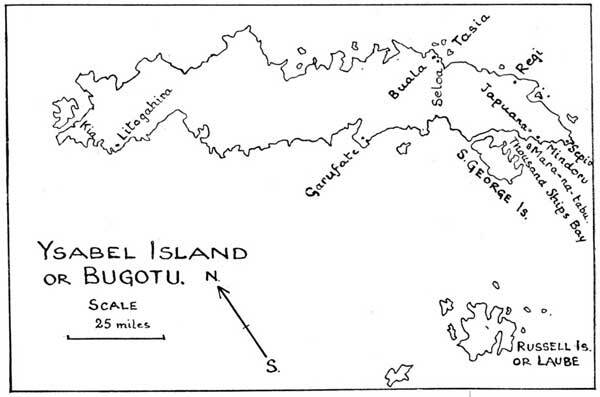 The "Government" had an establishment on the island of Tulagi (map No. 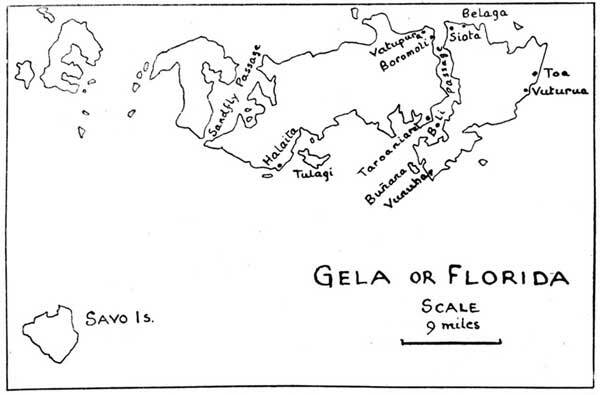 8), a previously uninhabited island off the coast of Gela. At first there was one official. Later on there were some sixty people at work. Coconut Plantations. The growth of these was of vast influence. They were established by white men. (Lever Bros. came in 1895). Thousands of coconuts were planted on coastal lands. Young Melanesians were engaged to work on a two years' contract. The Regulations governing the plantations were excellent and there was an itinerating inspector to see that Regulations were observed. This development was not a bad thing for the native at this stage of his experience of civilized ways, but the system could never be good as a permanent part of island life. Apart from other considerations it is more natural and therefore better for the men to live at home and to produce copra from their own trees. Absence from wife and family and home is in any case unnatural and unwholesome. 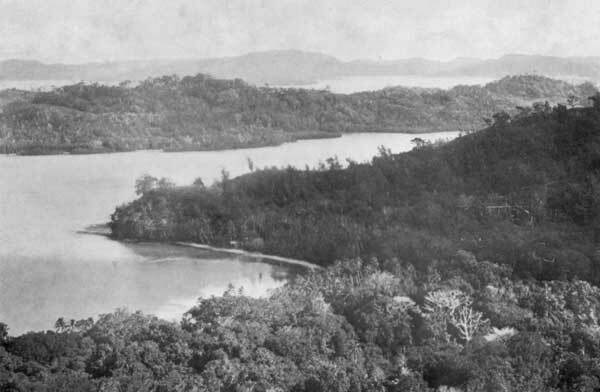 With the move to the islands in 1920 the Mission headquarters, as it were, broke up and its various departments were established on different islands. Village schools went on as they always had. From these suitable boys were drafted to the Central schools where a white priest was in charge. There was a School for Boys at Vureas, Banks Islands which is now New Vureas, Lolowai. This serves the southern part of the Diocese. Another school was at Bunana and yet another at Pamua both in the Solomons. Later on a bigger school was developed [9/10] at Maravovo, Guadalcanar. Buñana was closed down and later became a Girls' school in the care of the Sisters of the Cross. Pamua was closed but has quite recently become the Pamua Mothercraft School. All Hallows' School at Pawa, Ugi was opened and has become the Senior Boys' School of the Mission. Torgil, Lolowai is the Girls' School of the South. The College for ordinands was placed at Siota and once again after many vicissitudes it is there again--this is the Selwyn College. Siota is the site of the Cathedral. The Bishop's house is also there. A permanent Hospital was built at Fauabu, Northern Malaita in the Solomons and a Leper Colony established near by. 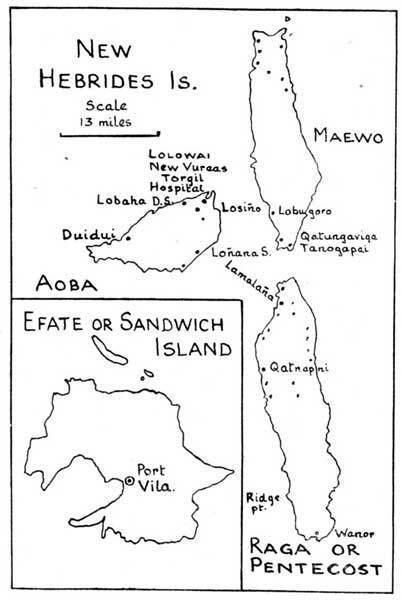 In the New Hebrides the Godden Memorial Hospital was built at Lolowai and a smaller Leper Colony established. Mothercraft centres have been started and Melanesian girls trained to work in their own villages. The Community of the Cross came to Melanesia and is now in charge of the Girls' Schools. They are also fostering vocations among native women. They work in villages, teaching and nursing. They care for orphan babies who would otherwise die and after they are old enough to stand village life the babes are returned to the care of relatives. Nurses, besides staffing the Hospitals and Leper Colonies, work in the districts, in pairs if possible and sometimes alone. They usually have built small hospitals to which some patients may come for treatment. An unending stream of teachers and ordinands passed through the Schools and College. The Church takes shape, the work is firmly established. War. In 1941/42 came the Japanese invasion. The enemy reached Guadalcanar and all the Mission [10/11] buildings north of that were destroyed. Missionaries who had not moved from the area were overrun. Two priests lost their lives, one being deliberately murdered by the Japanese. One woman worker was hidden by the natives for several months and was ultimately brought out by U.S.A. forces. Active missionary work was almost completely at a standstill, but the native Church stood firm and undismayed. The clergy went on with their work, the people attended Church, the Sacraments were administered. Conditions tested the bravest but there was no defection or slacking off. The Bishop and other members of the staff remained on the "edge" of the front and were able to take advantage of the position by doing intensive work among the people with whom they were temporarily living. They were also able to be of great assistance to the allied troops. After the liberation of the Solomons, work was resumed in circumstances of great difficulty. The Southern Cross was away "on active service", having been requisitioned by the Royal Australian Navy. Such launches as remained were scarcely sea-worthy. Supplies of every kind were short. The destruction of buildings made re-establishment difficult but wonders were worked and in temporary structures the stations began to function again. Before Bishop Baddeley left the Diocese in 1946 the Hospital was in full working order and the Leper Colony was slowly growing. Maravovo School had "risen again", although but in temporary buildings, and was in the care of a native deacon, himself an old Maravovo schoolboy. The Girls' School at Buñana was being re-established. Rats, formerly not seen on the island, had arrived during the war and were in such numbers that they were starving. They ate the newly planted seeds [11/12] and held up the work of restoration until the Community was reinforced with a number of cats! The damaged Cathedral had been restored and Siota partly rebuilt. Administrative Headquarters was rebuilt chiefly with materials supplied by the U.S. Forces. Many changes came about in the Solomons consequent upon the destruction caused by the war and the opportunity offered when reconstruction was possible. 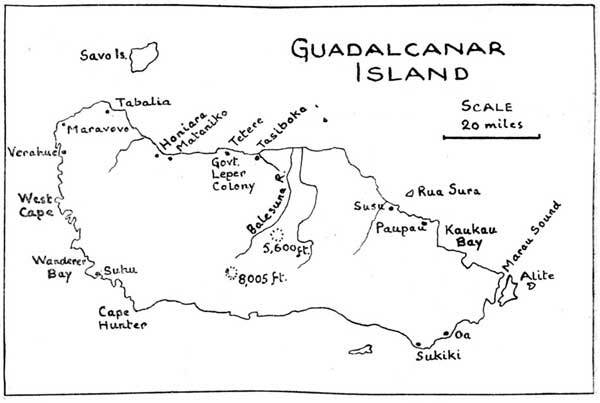 The Headquarters of the Government were placed at Honiara, Guadalcanar instead of Tulagi (see map No. 7). The absence of white traders and stores enabled the Government to initiate a scheme for the purchase of copra and the supply to the natives of certain commodities. There was a good deal of unrest among the natives, which expressed itself chiefly in a refusal to work for white employers unless for fabulous wages. This became the "Marching Rule" movement. There was some intimidation of men who did work and severe measures were taken .by the Government to suppress this. Bishop Caulton, formerly a priest in the Mission, returned to the Diocese in very difficult times. The small staff of white missionaries are being tested to the limit, but there is a tried and faithful body of native clergy most of whom were proved in the trials of invasion. Money is less plentiful than in prewar days and it is worth a good deal less. Yet, over and above the costly routine work, that of replacement and extension must go on. Melanesians can no longer be considered simply as primitive animists, although some such are still to be found. They are no longer an isolated people. Spaniard, thief ship, sandal-wood trader, recruiting vessel have come and gone: but Government [12/13] officials, commercial interests and defence services have taken their places. The enemy of the young Melanesian is no longer the old animism with its heritage of fear, but the new one (to him) of a godless materialistic civilization. The Church must live and grow or the race will perish. N. B. Other missionary activities in Melanesia. 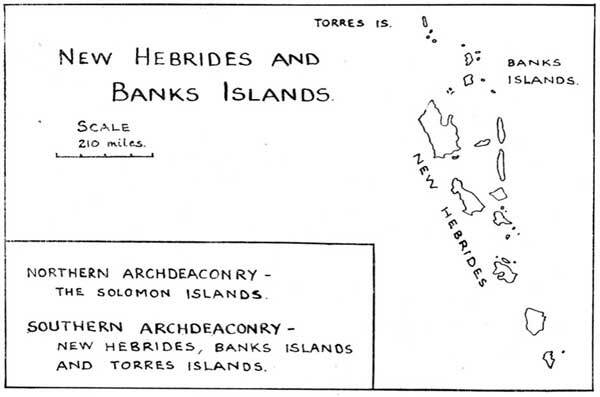 At the outset of the work Bishop Selwyn found Presbyterians at work in the New Hebrides. He made a compact not to go to islands in which they were already engaged. Similarly, an agreement was made with the Methodist body in the Western Solomons. These agreements have always been faithfully kept. The South Seas Evangelical Mission came to the Solomons from Queensland when islanders were expelled from Australia, and worked quietly and in a friendly manner. Later, Romans arrived in the Solomons and began to complicate matters. Later still Seventh Day Adventists arrived and brought further complications to the Missionary work. 1568. Mendana reached Ysabel . . . Bugotu. 1601. Fernandes da Quiros, Mendana's chief pilot, discovered the New Hebrides. 1767. Captain Carteret rediscovered Santa Cruz. 1768. M. de Bougainville rediscovered and named Bougainville and Choiseul. 1830. circa. Visits by whalers and traders. 1849. Melanesian Mission founded by Bishop G, A. Selwyn. 1861. John Coleridge Patteson consecrated Bishop of Melanesia. 1867. Mission headquarters moved from Kohimarama to Norfolk Island. 1871. Bishop Patteson killed at Nukapu. Santa Cruz group. During these years recruiters were carrying labour to and fro between South Melanesia and Queensland or Fiji. 1877. The Rev. John Selwyn, son of G. A., consecrated second Bishop. 1880. Memorial chapel to Bishop Patteson consecrated at Norfolk Island. 1892. Bishop J. Selwyn resigned after long illness. 1893. British Protectorate declared over the Solomon Islands. 1894. Cecil Wilson consecrated third Bishop. 1911. Resignation of Bishop Wilson. 1912. Cecil Wood consecrated fourth Bishop. 1913. Training College established at Maravovo, Guadalcanar. 1919. The Rev. John Manwaring Steward consecrated fifth Bishop. 1920. 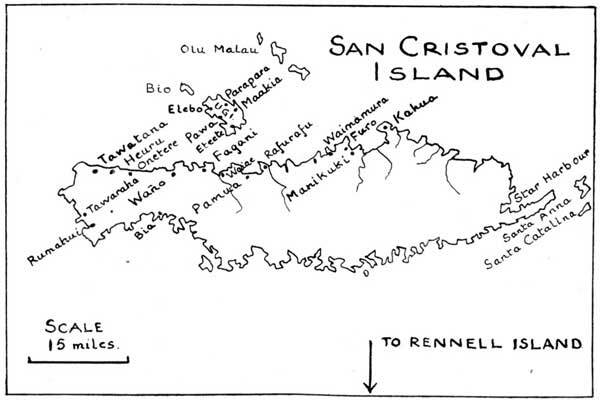 Mission headquarters moved from Norfolk Island to the islands and established at Siota. 1921. First Synod constituted at Siota. 1924. The Rev. F. M. Molyneux consecrated assistant Bishop. 1925. The Native Brotherhood formed. 1926. Work undertaken in the ex-German islands now Mandated to Australia. Territory, The Rev. E. Wilton. Resignation [14/15] of Bishop Steward and the appointment of Bishop Molyneux as Diocesan. 1929. The Hospital of the Epiphany established at Fauabu. The Community of the Cross founded in Melanesia. A Mothers' Union Branch started at Fiu, North Mala. 1931. The Rev. J. C. Dickinson consecrated assistant Bishop. 1932. The Rev. W. H. Baddeley consecrated seventh Bishop. 1933. Southern Cross VI launched and lost on Aneityum Island. 1933. New Southern Cross VII. 1934. Patteson schooner given by New Zealand. 1936. Godden Memorial Hospital opened at Lolowai, New Hebrides. 1943. Defeat of the Japanese in the Solomons and the resumption of activities. 1947. Resignation of Bishop Baddeley. 1948. The Very Rev. S. G. Caulton consecrated eighth Bishop. 1949. New Britain and some islands of the Mandated Territory transferred to the Diocese of New Guinea. 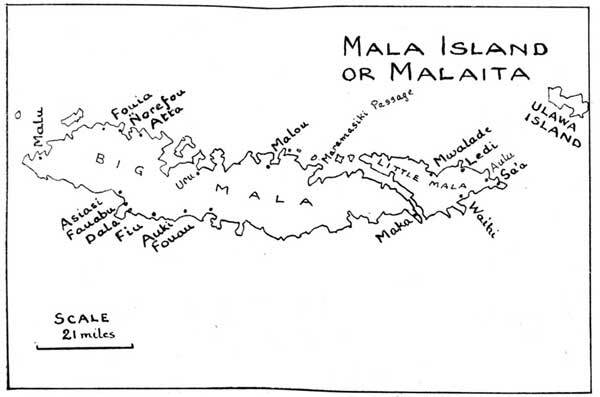 What people first discovered the islands of Melanesia? Who came next to these areas? When was Captain Cook in this neighbourhood? Where is the Diocese of Melanesia? What are the two administrative divisions? What are the chief island groups of the Diocese? How does a Polynesian in general differ from a Melanesian? What were the stages of the contact of white men with Melanesians? Who began the missionary work and in what year? What method was used to evangelize the people? Who was the first Bishop of Melanesia? What happened to Bishop Patteson ? What were the stages of the Mission approach to the people? What advantage did Norfolk Island offer over Kohimarama? What developments occurred upon the move from Norfolk Island to the islands ? To what trial was the Diocese subjected in 1942? What were some of the effects of the invasion? Under what special difficulties was work resumed?